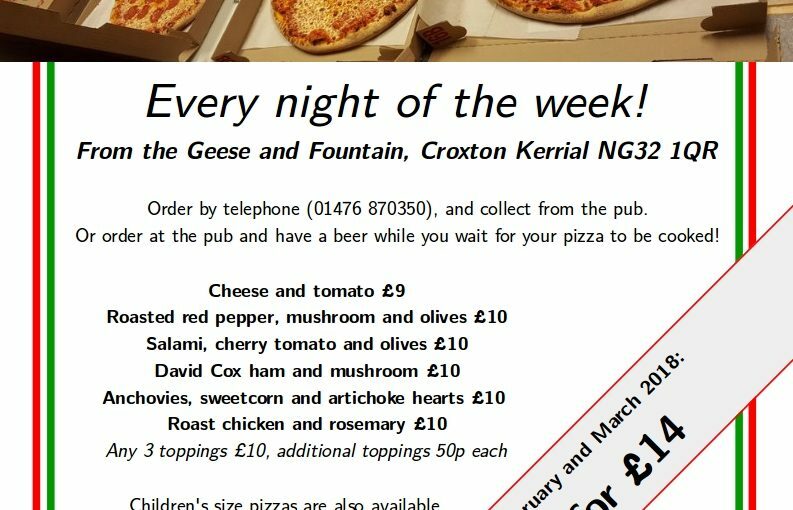 Now every night can be pizza night in the Vale of Belvoir, as the Geese and Fountain brings Take Away Pizza back to the menu. And until the end of March 2018, there’s a great offer on Take Away Pizza: any two pizzas for just £14. Freshly hand made and stone baked, our pizzas are made in the true Italian style: thin, crispy round the edge but loaded with cheese and a delicious tomato sauce. Pizzas are available between 6pm and 9pm Monday to Saturday, and between 5pm and 7pm on Sundays. Sorry, we can’t deliver. Download our menu, and call us on 01476 870350 to order, or just come down to the pub. Then have a drink while you wait, and take home delicious freshly-baked pizza.